There’s a huge bug in the way we do developer evangelism. It needs a little Glitch instead. This is… not so good. If we compare it to the hyper-optimized customer funnels used on e-commerce sites, this method of acquiring platform developers sounds downright absurd. Why do we still do developer relations this way in 2017? This is why we made Glitch For Your API. At Fog Creek, we know a little bit about making things developers like. (In the past, our team invented Trello, co-created Stack Overflow, and pioneered bug-tracking with FogBugz, still beloved today by teams that make great software.) Building on that history, we’ve figured out what the industry needs to do to bring API evangelism into the future. Glitch is a friendly community where anyone can make the app of their dreams. And now, it powers Glitch For Your API: the ultimate way to help developers succeed with your platform. 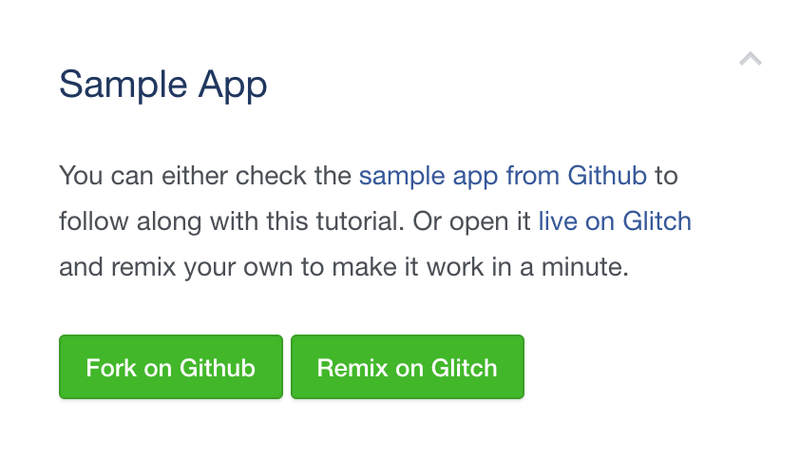 Put a “Remix in Glitch” button on your site right now to help any developer get your API’s sample app running in about one minute. No dev environment to set up, no servers to provision, no issues with the app not being able to talk to services while it’s running on localhost. They might have to copy & paste an API key, but that’s about it. Get your team on Glitch so they have the tools to collaborate with new devs in realtime, on their actual running code. If these devs hit any snags or errors while trying your API for the first time, you can help them fix it immediately. Start by using your existing Node.js sample apps or SDK, which you can automatically import from GitHub so you don’t need to do anything to keep sample apps up to date. You can try this right now! Go to https://glitch.com/edit/#!/import/github/[YourOrg]/[YourRepo] and watch Glitch import your Node sample app. Help your developer community become more diverse and inclusive by promoting sample apps on Glitch, where we have a zero tolerance policy for harassment and abuse, and actively manage our community to encourage underrepresented coders to participate. This is all free for any company and any API platform to use. And all these features will stay free. Glitch For Your API is so much better than the ways we’ve been doing API evangelism in the past that smart companies are already making use of its features today. On Facebook’s Messenger API page, the “Quick Start” offers some great, easy options for developers. You can see the power of Glitch For Your API in action for Facebook’s Messenger API documentation right now. Check out their Quick Start guide, and time how long it takes for you to get from clicking the “Remix in Glitch” button to having working, running code in your browser. It’s not just the biggest companies or platforms that need this stuff. We’re seeing teams of all sizes make great use of Glitch For Your API as we’ve been previewing the features. 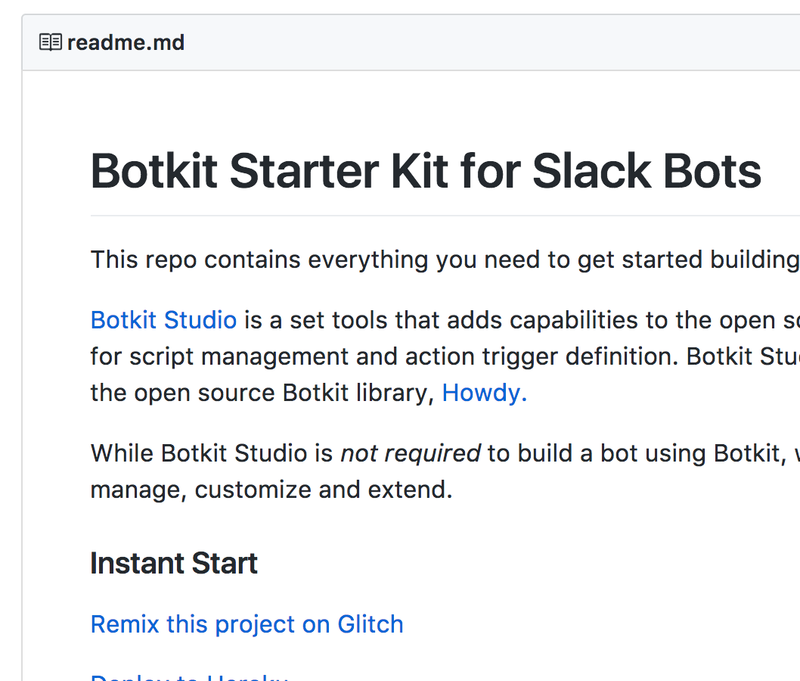 Take a look at our friends at Howdy, who’ve fully integrated Glitch right into the README file for their Botkit Starter Kit for Slack. Instead of explaining all kinds of setup, they focus on what’s unique to their platform. What could be easier? Nothing, that’s what! Want to do fancier things like virtual “office hours”, where you can offer live support on Glitch to developers who are trying your API? Want custom subdomains for your Glitch projects so developers can remember your product and your brand? All of that is free, too. Drop us a line and we’ll send you a complete guide to how your team can make the most out of Glitch For Your API, too. What if you could watch devs build on your API, and help them when they get stuck? A live catalog of sample developer apps: We’ll create a custom, branded landing page that showcases an unlimited number of sample apps to show off your API — anything from Hello, World to a Facebook killer. Need help building those sample apps? We’ll lend a hand there, too. Requesting live help: Coming soon, Glitch will allow any user who gets stuck to virtually “raise their hand”, so you’ll get notified the moment any user gets frustrated or stumped while using your API. You can fix the error before they even think of using your competitor’s APIs. Shape the Glitch For Your API roadmap: We’re inviting the first paid users of Glitch For Your API to help define which features we prioritize, including which analytics to include and even more advanced tools for assisting developers. When fully launched, we expect Glitch For Your API’s paid features to cost roughly the price of sending one evangelist to one event each month. Somebody on your team can stay home and hang out with coders on Glitch instead of handing out t-shirts and scanning badges at a conference. Doesn’t that sound nice? Get in touch and we’ll fill you in on what we’ve got planned.